SC Rock had brought in quite a bit of machinery from May — from loaders, to excavators, to haul trucks, to a host of support equipment. Like all mine owners, Bill Griste Sr. has millions of years of geological forces to thank, in large part, for his success. His company, SC Rock, is in South Carolina's coastal region, home to a rich vein of marine limestone that formed around 10 million years ago. 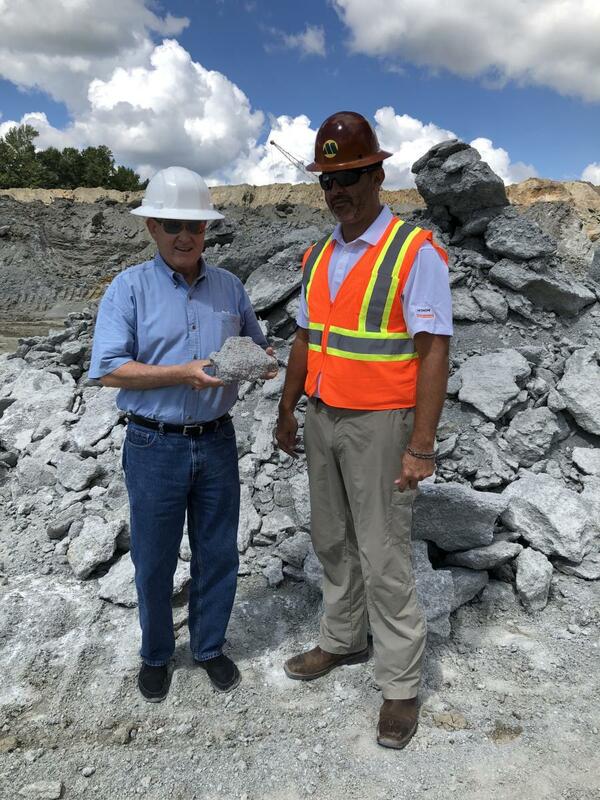 This type of rock is a first-rate road-construction product — high enough to pass DOT requirements for aggregate material use in both North and South Carolina. That keeps SC Rock's Goretown mine humming with activity. Griste's company is located at the site, just outside Loris, in northeastern South Carolina, minutes away from the shining sands of Myrtle Beach and not too far from the North Carolina border. That proximity to the coast gives SC Rock an edge in the aggregate-materials marketplace. In fact, the entire economic expansion of the greater Myrtle Beach area has been a boon for SC Rock. Several highway construction projects have recently been built in the tourist mecca, some of which Griste and his crew have helped supply. "There are only two local providers of stay-proof aggregate materials in this area, and we are one of them," Griste said. "The other materials that are sold locally are railed in or have to be hauled in by trucks. So, we have a built-in economic advantage to start with due to how close we are to the Myrtle Beach area." 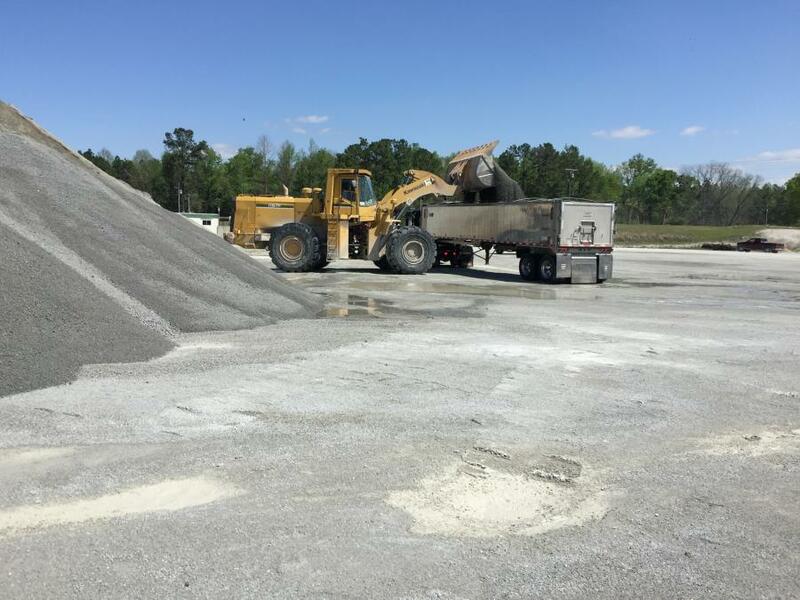 Recently, SC Rock finished supplying an important road project along S.C. Highway 707 on the south end of Myrtle Beach. "A. O. Hardee & Son Inc. Construction had the contract for widening S.C. 707 and all the material for that project came from here," he added. "It was over 5 miles long — a big project." Just to the north of the Grand Strand, in North Carolina, SC Rock worked again with A.O. Hardee on the widening of Old Georgetown Highway using ABC, a state-approved material. The road travels between Calabash, N.C., north toward Ocean Isle, an area popular with beachgoers. But location and Mother Nature are just two factors in the success of SC Rock. 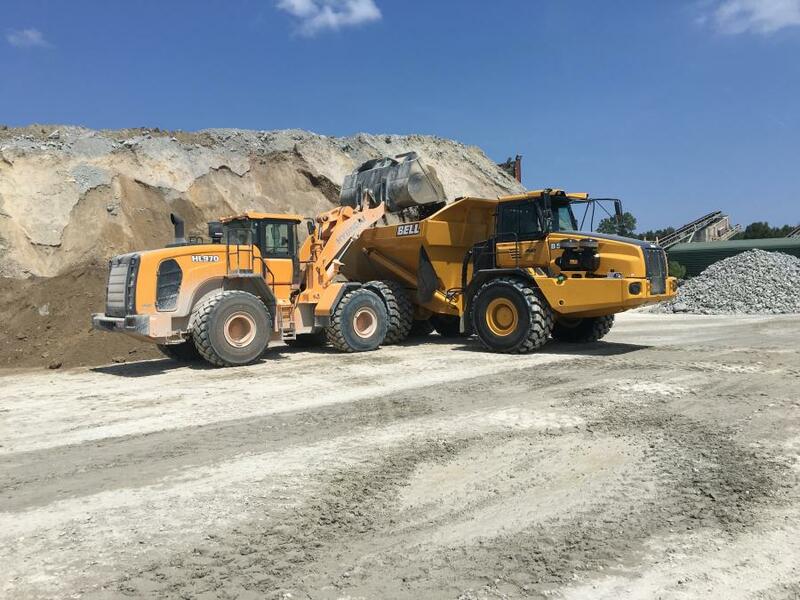 Griste also has benefited from both his business acumen and his association with May Heavy Equipment, a top-shelf dealership with sales, rental and service locations across both Carolinas. Griste discovered the deposit in 1998 and opened the Goretown Mine at the site before selling it to another company in 2005. In 2014, he re-acquired the mine and renamed it SC Rock. 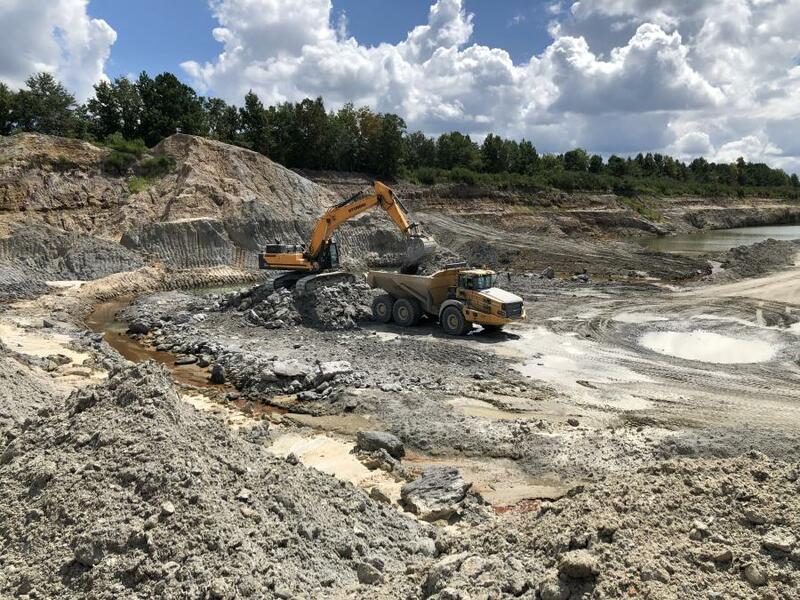 The operation uses large draglines and excavators to extract the recrystallized marine limestone deposit, which consists of a mix of big and small hard boulders and crystalline fines. 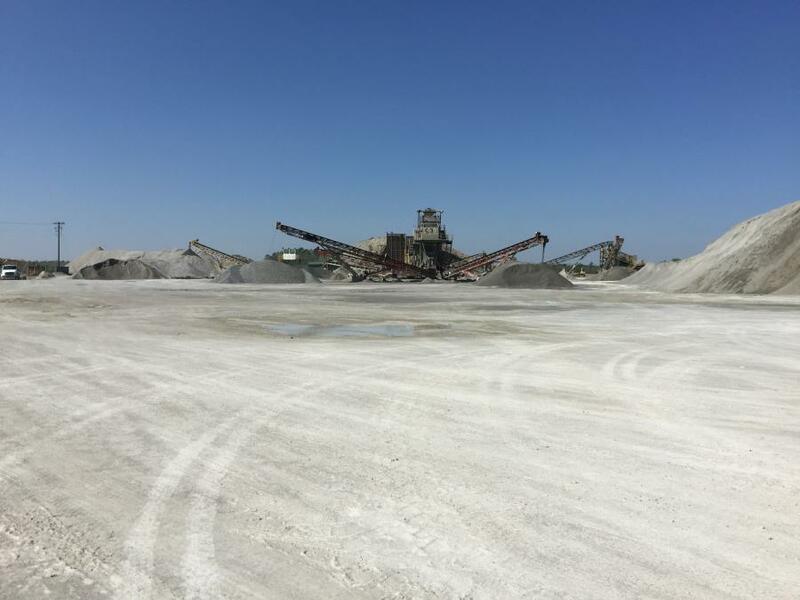 The excavated deposit is fed into a fixed plant that uses a Hazemag horizontal impact crusher along with Deister dry and wet screens to make aggregate products that end up being cubicle in shape with a more hardened surface area. "The rock has great capacity for locking together and that is one of the main things you look for in a construction material, something that will bind particles together. We are blessed to have this deposit turn that out," Griste said. "We also have the capability of making either all-base materials of various grades and degrees of spec, or we can divert part of the material flow to our wet-processing operation to wash it and make it into the different clean-stone products we offer," he said. "The states require us to process it that way. The clean stone we produce also must meet sieve analysis/specifications for the various sizes of stone that the DOTs need. The clean stone that we are set up to make here are 789s, 57s, 5s, and washed screenings." SC Rock's aggregate bases are used by North Carolina DOT (ABC) and South Carolina DOT (MLBC). 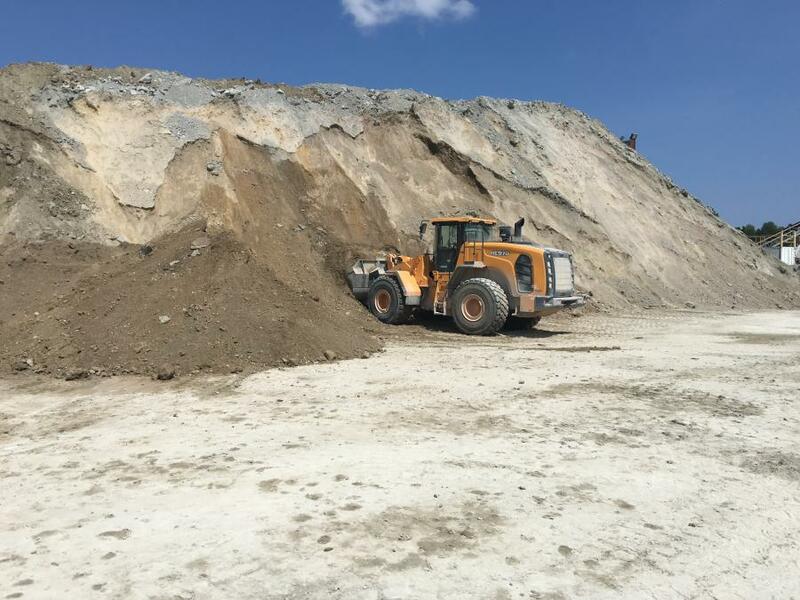 A non-spec grade called commercial base also is a popular product at SC Rock, as well as a fine-base material with smaller top-size rock in it. In all, Griste's plant makes five base products and another five clean-stone products. 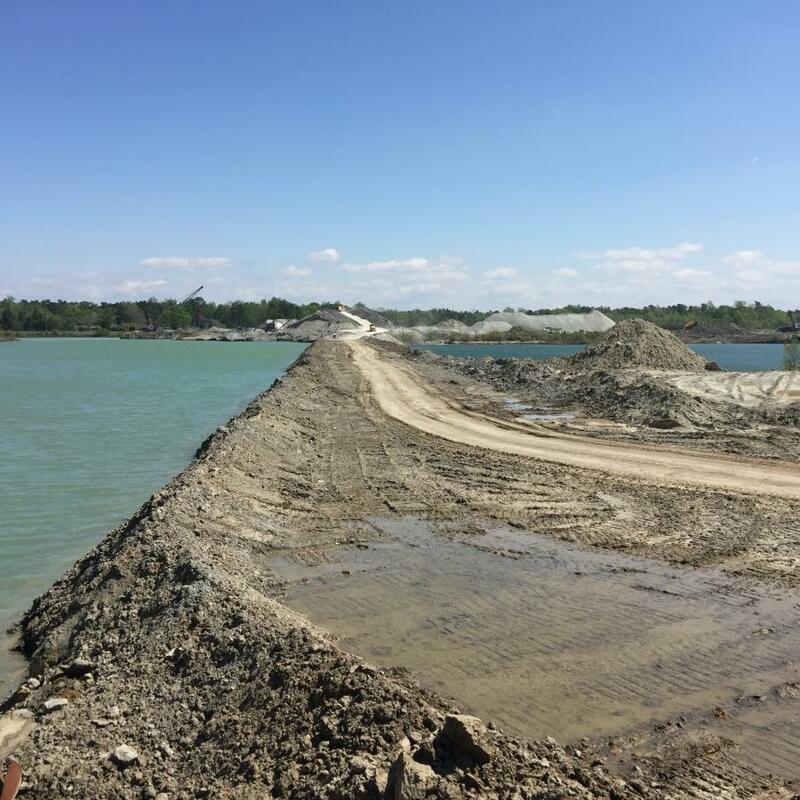 He also sells different types of riprap, landscaping boulders, as well as fill dirt and topsoil excavated from above the much older limestone layer. Additionally, SC Rock processes sand for use in construction jobs. A haul road through the Goretown Mine allows off-road trucks and other equipment to travel as far as 2,000 ft. to the bottom to extract and haul out the limestone. 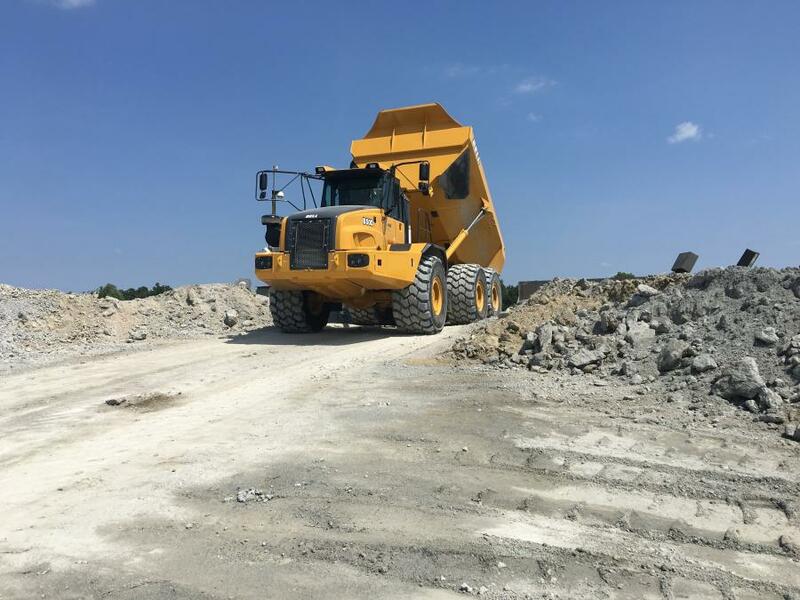 Griste said his company uses Bell articulated trucks for taking extracted limestone to the plant for processing, as well as to remove overburden. He likes the versatility of Bell trucks, which saves him money in that he doesn't have to buy or lease two different types of equipment. SC Rock has three Bell trucks in near constant use during a workday because they help to keep raw materials feeding into the processing plant, which can produce 750 tons of material per hour. "As you move around to different locations, sometimes it takes just two trucks to achieve that and sometimes it's not adequate and you need a third truck," Griste explained. "Three trucks, though, gives us the flexibility with a little bit of a cushion. Maybe at some point in time we will need a fourth Bell truck." May Heavy Equipment also has been able to provide SC Rock with a large fleet of Hyundai products, Griste reported. "I think we've got a little bit of about everything they make," he laughed. "We have various-sized loaders and excavators, including a mini-excavator and three or four larger sizes, all the way up to Hyundai's largest model for construction. We may talk to them in the future about their bulldozer line, too." 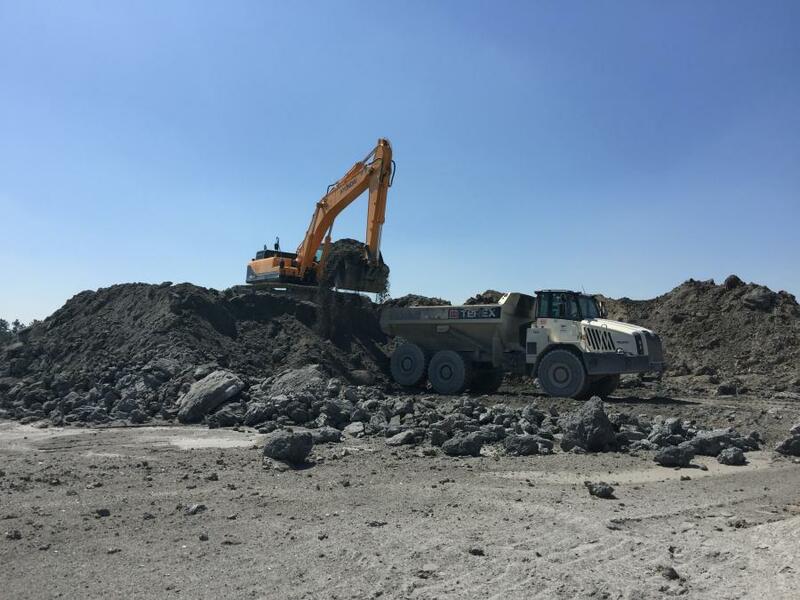 Through May Heavy Equipment, SC Rock recently acquired two Hyundai HX220L excavators and a Hyundai HL975 wheel loader, the latter of which will be paired with the HL965 model that Griste already had in operation at the mine. Since SC Rock opened at the Goretown Mine four years ago, Griste and his people have been able to overcome roadblocks along the way to make the company prosperous. "We had several production challenges and had to upgrade the plant," he said from his office. "And, as far as the equipment, I had to do several upgrades and many retrofits of pieces that were just worn out." "That's why I own a lot of equipment I got from May Heavy Equipment," he continued, "because I was left with the choice of putting a lot of money into fixing old equipment or going with newer machines and not worrying about the down time. Being in production is all about having equipment available and May was right there to help us out with either leasing or purchasing." As a result, SC Rock brought in quite a bit of machinery from May — from loaders, to excavators, to haul trucks, to a host of support equipment. The decision to turn to May Heavy Equipment to supply its mining operation, in Griste's mind, was a no-brainer. "Number one, they solved our business needs aggressively," he explained. "They were able to come in and provide the equipment that I needed in a timely fashion. Then, they had the service support that we needed because we don't have the time to maintain the equipment ourselves, as we are all about production." May Heavy Equipment also has helped put SC Rock in touch with the right people to lease and purchase the machinery it needs on the job. The relationship between the two businesses is mutually beneficial, Griste said, and has helped SC Rock grow to the next level. "May has gotten to know my business and recommend things to me from their point of view," he continued. "They know what I want to achieve here. They have given us advice on the equipment and, as we've gone on, added some more lines, with more equipment to choose from."